Poetry and writing for inspiration and personal growth. You are strong like mom and dad raised you to be. You are an island and don’t need to ask for help. You don’t even cry when times get hard. You just keep pushing forward and do what you know. You push all of it deep inside of you and don’t even acknowledge that life is much too complicated. You have this one under control. No one will ever know what you have been through or how tough times have become. You will not breakdown. You will not hang your head. You will walk with pride in your step. Does this sound familiar? 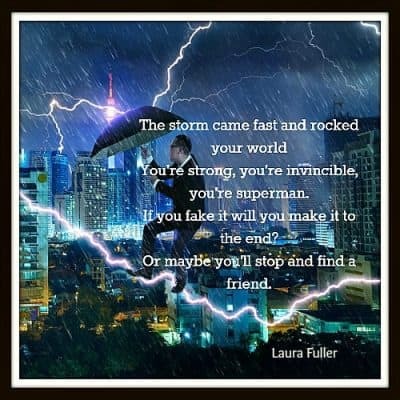 It is important to be strong and weather the storm with strength. But who ever said that means you have to do it all by yourself? You head to your car peering over your shoulder at the darkening heavy rain filled clouds in the sky. You believe you you have time to make it to the store and back before the clouds start dumping rain on your day. The store you have in mind is only 5 miles away. The skies are a gray. The clouds are thick and moving fast over your head. It hasn’t started to rain yet. You need to run some errands before your big party tonight. Your BFF offered to pick up some things for you from the grocery store, but you didn’t want to put her out. Now you wish you were able to ask for help because time is running out and a big storm is moving in. Just 2 miles into your trip the torrential rains start. The winds pick up to 30 MPH, and your car begins to rock. It’s becoming harder to keep it on the road. You will keep going because you have to get to the store. The wind picks up to a tornado gale. Your car starts blowing sideways. You can barely see through the sheets of rain. When you do get a sight of the road, you realize the wind is sweeping you off of a bridge. With a thump, you end up in the creek below. It was a horrendous 4-foot drop. Your car lands on its wheels, so you open your door to get out. You fall into the creek gulping in water as you begin to dog paddle to stay afloat. You are losing the battle to stay alive. The air is being whipped out of your lungs and replaced with water. Death is right around the corner, and no one is there to help you out. The wind and rain suddenly stop, you look down and realize you are standing in 3 feet of water. So you put your feet down and walk to the edge of the shore. Do you see the picture I have painted for you? No one is superman, and no one can survive alone. Every one of us needs to rely on others to help us. If you were Superman you would have been able to survive raging deep waters and carried the car back to the road and how realistic is that? Friends are the backbone of support in your life. God gave you the ability to have friends to lean on and for them to lean on you.